Small Audio Visual Rental packages. Boston Projector rental, wireless microphone rental package, event AV rental packages. Need a projector? A wireless microphone? Or a flat screen monitor? We can help! Listed below are typical AV packages that customers commonly order. Packages can be custom designed to fit your needs and space. Customer pickup available. Delivery charges to the Boston Metro area range from $75-$100. If you have a question, please contact us, or call (617) 923-0055. Laptop Sound Add On Kit -A good addition to the Breakout Room Projection kit if you need sound from your laptop. 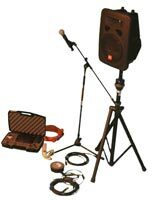 Large Wireless Microphone and Speaker Combo - (For audiences from 75 - 15,000 people) Please call for a custom consultation. DVD player or Solid State Media Add On Kit - A good addition to the LED Panel Kit if you want to loop media in a public space. Please note that transcoding your media to the Solid State player is a service we will be glad to perform for an additional fee. Custom Projection Kits available upon request for audiences of 10 to 1000 or more people. Please call for a custom quote.